TAXIWAYS: All roadways throughout the airpark are considered taxiways and aircraft have the right-of-way over vehicles, pedestrians, or horseback riders at all times. Taxiways may NOT be obstructed at any time. All aircraft must be tied down or contained within a hangar. The Ruby Star Property Owners Association accepts no liability for the security of aircraft. HOT SPOTS: The intersections of the three north/south taxiway/roads that cross the runway are RUNWAY INCURSION HOT SPOTS and have a red arrow pointing to them in this photo. Be alert for vehicles crossing at these intersections. RADIO CALLS: Announce your position and intentions both on the ground and inflight. LANDING LIGHTS: Turn on Landing Lights at all times to increase your visibility to other aircraft, pedestrians, and vehicles. 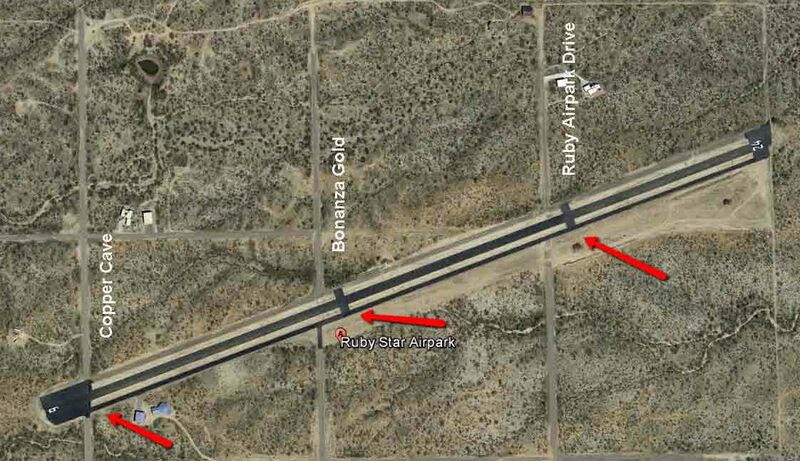 VEHICLE CROSSINGS: Copper Cave (the west most taxiway intersection) is the preferred location for vehicle crossings. Vehicle crossing at any other location is discouraged. Operators of aircraft and vehicles must EXERCISE EXTREME CAUTION! AIRCRAFT TAXI OPERATIONS: Monitor 122.90 as soon as possible after start for traffic awareness. ANNOUNCE Taxi Out, Taxi In and Clear of Runway. Back Taxi – If Back Taxi is utilized, announce intentions and Turn On Landing Lights.